Mikael Colville-Andersen’s upcoming visit, his second in the last eight months, has been promoted with a wonderful graphic showing the relative ease of moving within a liveable city. This contrasts nicely with another Copenhagenize graphic showing the evolution of traffic planning. On a frustrating slow morning bus commute from Bonnevoie to Kirchberg, where Mikael Colville-Andersen will be presenting, I began thinking about how Luxembourg’s traffic planning compares between modes. Using Google maps and mobiliteit.lu I requested directions by foot, car, bus and bicycle from Bonnevoie to Rond Point Schuman. The remainder of the trip to the Luxexpo venue has little of interest and has been clipped. I overlaid a map showing the suggested directions on OpenStreetMap data. In a graphics editing program I cleaned up the paths to increase clarity by altering paths in proximity to one another so they became adjacent. 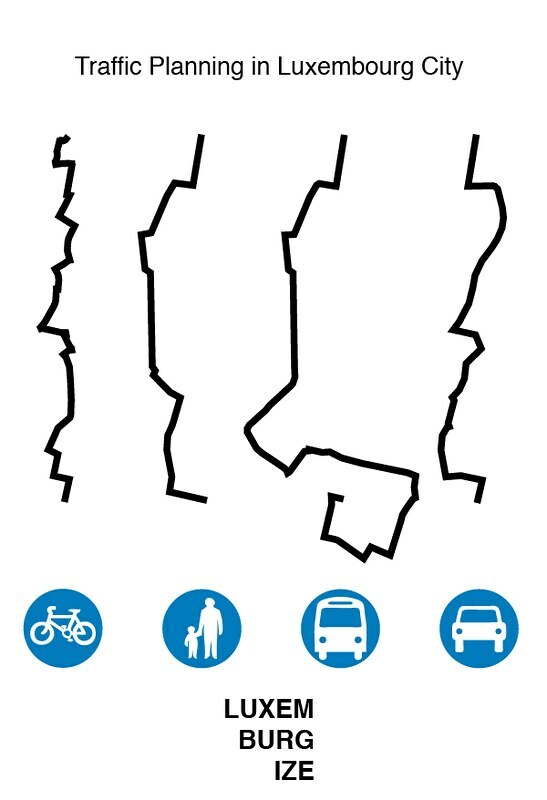 This figure shows little distinct difference between the cycling, pedestrian and car paths. 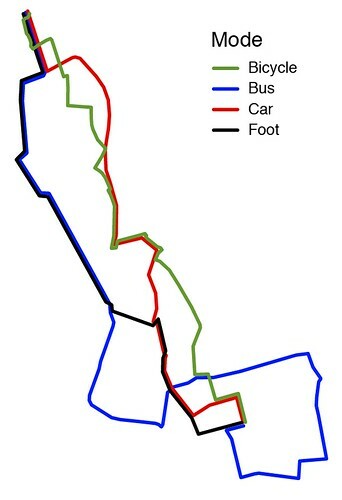 I finally arranged the paths in a similar fashion to Copenhagenize’s earlier figures. The effect is clearly not as the strong as in the evolution of traffic planning figure. Keep in mind however that for pedestrians there are many crosswalks to wait at and eventually traverse. At this small scale it’s not possible to display them. Cyclists spend very little of this road on a separated bike lane – 300 metres perhaps. The bus that is closest to my home has the unfortunate responsibility of spiralling through the whole neighbourhood before making any progress. While this figure demonstrates the physical path of each mode it does not communicate the reality of the feeling of traversing the space. The bus is perhaps the best represented. Taking the bus through the city during peak traffic is maddening and inefficient. A lack of dedicated bus lanes allows cars to penalize bus commuters trying to use a sustainable mode of transportation. I suspect the trip duration between these two points at rush hour(s) is shortest for the bike with cars and bus arriving 5-10 minutes later. Pedestrian’s are potentially exposed to the highest amount of vehicle emissions due to the length of time of their exposure. It is perhaps dangerous to express efficiency of modes in distances, directness or maps. These are the tools that planners have been using to design our cities. Maps containing lines do not express the feeling, noise, smell and emotion that those experiencing the ‘lines’ are feeling. How many decision makers and planners attending Mikael’s talk will feel their streets in anything but a luxurious sedan I wonder? An interesting metric is the number of instructions like “turn right onto rue du Saint-Esprit” you have to follow according to Google: 10 for pedestrians, 13 for motorists, 16 for cyclists. So many squiggly lines, so many places where you can get confused and take a wrong turn, especially if you’re just starting to cycle.